This photo of President-elect Lincoln was taken in February of 1861 in Springfield, Illinois two days before leaving on his trip to Washington D.C. for his inauguration and depicts what he looked like when he spoke in Peekskill just 10 days later. 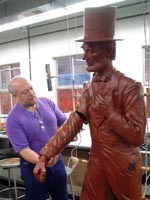 Pictured above is Michael Griest, a local resident who recreates the Lincoln remarks in Peekskill as part of the Lincoln Society's annual commemorative events. On February 19, 1861 President-elect Abraham Lincoln made his only stop in Westchester County, NY as he traveled by train from his home in Springfield, Illinois to Washington D.C., for his inauguration as President of the United States. "I have but a moment to stand before you and thank you for this reception, and for the pleasant manner in which it is tendered to me by our mutual friends. 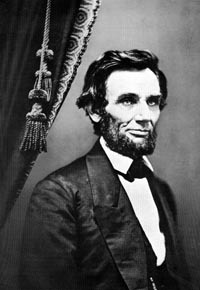 I will say in a single sentence, in regard to the difficulties that lie before me and our beloved country, that if I can only be as generously and unanimously sustained as the demonstration I have witnessed indicate I shall be, I shall not fail; but without your sustaining hands I am sure that neither I nor any other man can hope to surmount these difficulties. I trust in the course I shall pursue I shall be sustained not only by the party that elected me, but by the patriotic people of the whole country." Peekskill has never forgotten this historical event. 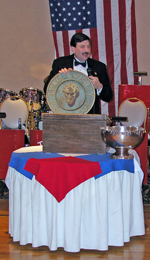 Since February 12, 1904 the Lincoln Society in Peekskill has been the single oldest continually active Lincoln Society in the United States. In 1925 the Society dedicated the Lincoln Exedra on South Street, overlooking the depot site where Lincoln spoke. From 2002-2007 Mayor John Testa was able to obtain the necessary funding to purchase the Lincoln Depot site and facilitate the complete renovation of the exterior of the structure. 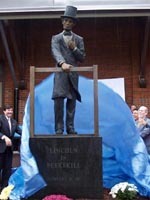 The Lincoln Statue was dedicated in 2006 on the Depot site and the Lincoln Depot Foundation will continue the process of the restoration of the depot interior, creating an information center and establishing the Lincoln Depot Museum. The original depot structure is still standing from the 19th century. Although there has been a mix of materials used to repair and rebuild the structure over the years, the main brick structure has remained intact. Thanks to NY State grants through Governor Pataki, the City of Peekskill was able to obtain the depot and property and plan the restoration of the structure and creating a historic site and museum. 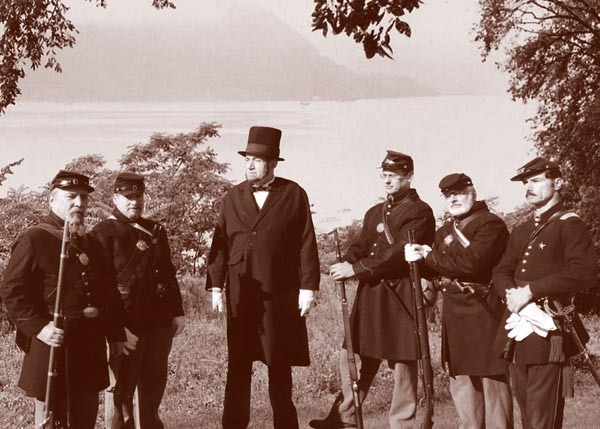 In 2007 the Lincoln Depot Foundation was created to manage the site, continue the use of the grants for the building to ensure the interior restoration and work along with the City of Peekskill to develop the depot property to create a "Lincoln Plaza" and visitor's center. The original 19th century Centennial Firehouse located across the street from the depot is to be moved to the depot site and be adapted into a part of the Lincoln Depot Museum historical site. Click here to see before and after photos of the depot structure and other information related to the Lincoln Depot project.